This high speed, action packed card game is designed for 3 to 4 players. The players bid, and compete in order to score the most points. Bluffing, luck, skill and showmanship are all part of the winning formula. 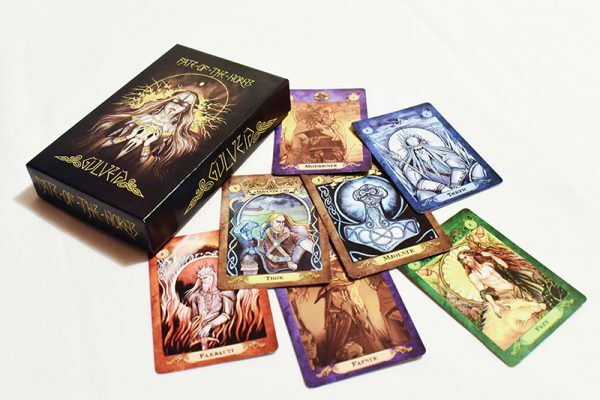 The game revolves around the spirit of greed, known as Gulveig, that incites 4 mythic clans to compete for a treasure, pushing players to extend themselves in order to outdo their opponents. The rules are simple, fitting on a small folded page that included with the deck of cards. Rules in English et en Francais. PNH0300 “Dwarven Kingdoms” adds 11 new cards and 1 more faction to the Gulveig game. Rules have been streamlined for 4 player games and an exciting drafting variant has been added.